South Mauritius Vortex. . . 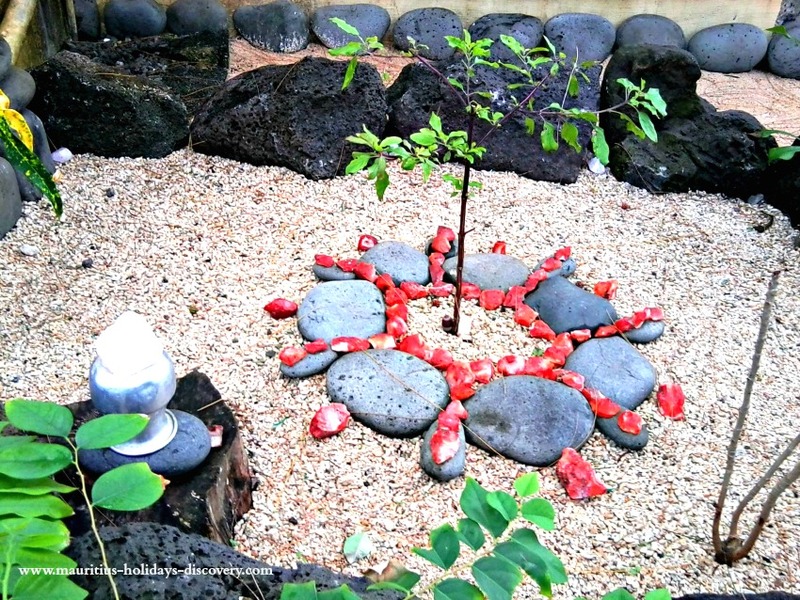 The south Mauritius Vortex is a numinous healing center. A spiritual belief goes that it is inhabited by Beings of Light acting as Celestial Physicians to regulate problems of energetic imbalance which cause ailments in the physical body. The resulting effect is a vibratory upliftment which has the potential of balancing bodily energy circuits – the chakras and meridians. Benevolent on-site spiritual guides will assist you in your quest for health, harmony and spiritual development. It is recommended that you spend at least twenty minutes in the vortex. The Starting Point. . .
Nestled amidst Filaos trees in a secluded part of Riambel on the coast of South Mauritius, the Vortex is indeed a very serene place. On that windy winter morning after a brief introductory tour around by Shiv, the center’s curator, I must admit I had a twist on my rational sobriety. My curiosity about how this place was discovered was aroused and through a large smile Shiv answered my question by introducing me to Cathy Muller. 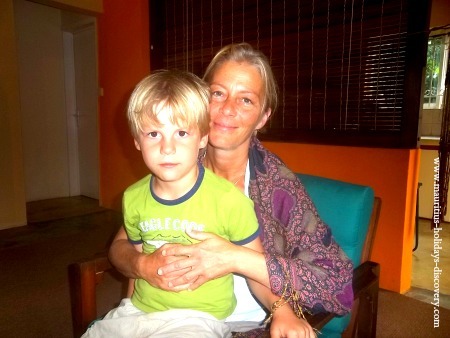 Gracious and with a balanced demeanor, Swiss-born Cathy was on holidays in Mauritius. The vibes of her spiritual vivacity precede her soft steps and with a subtle blend of reserved enthusiasm she welcomed me for an enriching conversation around a citronella infusion. It all began in 1999. Cathy was a happy mother leading a normal life. She would acknowledge her spiritual quest was middling. Then, three months after coming to our island a tragedy swept into her life. She lost her eldest daughter Lina who had health complications. Cathy was utterly devastated and everything around her seemed to crumble. While silently overcoming her bereavement a strong urge steadily developed and pulled Cathy towards a quest to understand the meaning of Life, Death, God and above all how to stay connected with her 10-year-old Lina. As the days go by a new light dawned into her life and she courageously turned a breakdown into a breakthrough. She learned to communicate with the Source and Celestial Guides to be a medium for the spiritual betterment of planet earth. Mrs. Muller is now a channeler. She supports many in their healing processes and spiritual awakening. Cathy also trains people in channeling – a natural inborn quality in every human being to receive and ground spiritual messages. She is also a writer. Do You Have A Great Story About South Mauritius Vortex? Have you had a healing experience or spiritual connection at the Mauritius Vortex? Do you want our visitors to read about it? It's easy and we'll be delighted to hear from you. Guided by Beings of Light, Cathy was instructed to identify and locate 14 energetic vortexes in the world. The first one, under the care of the Association des Travailleurs de l’Amour (TDA), is at Riambel, Souillac and was activated on 31 July 2007. The South Mauritius Vortex is considered a place where Being of Lights not only heal the sick but transform one’s life into embracing Love, Peace and Harmony. 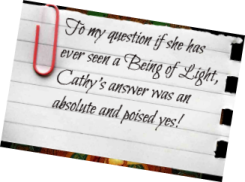 To my question if she has ever seen a Being of Light, Cathy’s answer was an absolute and poised yes! ". . . and how does a Being of Light looks like? :-)" I asked. Her enlightened smile satisfied my curiosity deep within and she sensed it. Nonetheless, she explained that the Celestial Guides manifest into our lives through what we are already familiar with. Being of Catholic Faith, these Beings emblematically appear to her as Jesus and Virgin Mary. At times she could see visions of Lina and recently, to her surprise, her connection to the spiritual realms was through the mental image of a peacock – a symbolic peafowl common in the Dravidian mythology of South India. Surrounded by the loving fondness of her companion and three children – Lucie, Sanjana and Samuel, Cathy is now living an accomplished life. She has resolutely more than dedicated her Life Journey in making the world a better place. Within the boundary of my terrestrial existence, I would say that today I met a Being of Light as personified by Cathy Muller! The south Mauritius Vortex, not associated with any religion, is opened everyday from 09:00H till 16:00H.